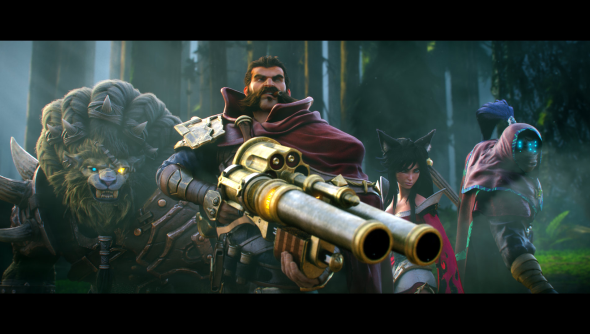 There are things we’d change about League of Legends but it’s not their cinematics. Riot don’t often have call to release a cinematic trailer, they don’t exactly release sequels, expansions, or new campaigns for their one map MOBA. Instead they release cinematics whenever they damn please. It’s good thing, too, because when they do release them they’re bloody gorgeous. The video follows Ahri and Leona as they race through the jungle and are intercepted, first by Kat, and then a whole team of champions. The video then descends into an extended teamfight where we see the likes of Grave, Draven, and Rengar tear each other to shreds. Riot have said in the past that the only reasons for these cinematics is to flesh out the world their players spend so much time in, to show what the game is on ground level. It’s a little eerie seeing the game presented in this way because, while it looks good, it’s not how I see these games. It was the same, for me, when watching Valve’s documentary, Free To Play. Every few minutes the action of the Dota game would be represented in a cinematic instead of actual game footage. Riot have released a making video to explain how they animated and scripted the video show their chosen heroes at their best.